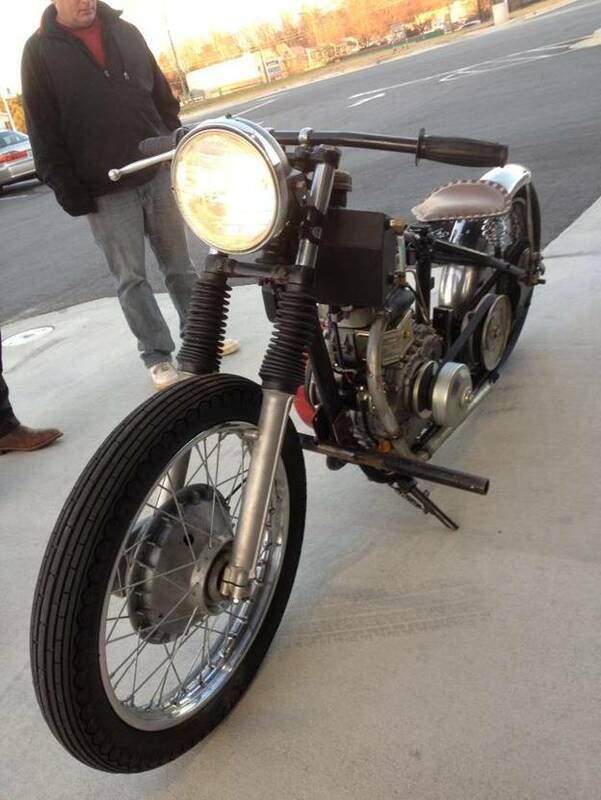 DieselBike.net | Triumph Diesel Bobber build report. 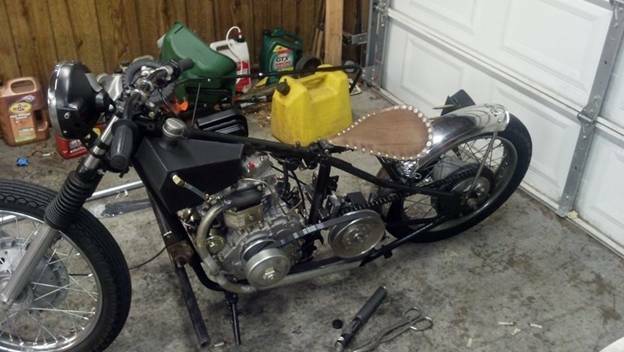 As a Mechanical Engineering student I am always looking for things to build, I decided I wanted to build a high MPG vehicle to commute to school and work with. 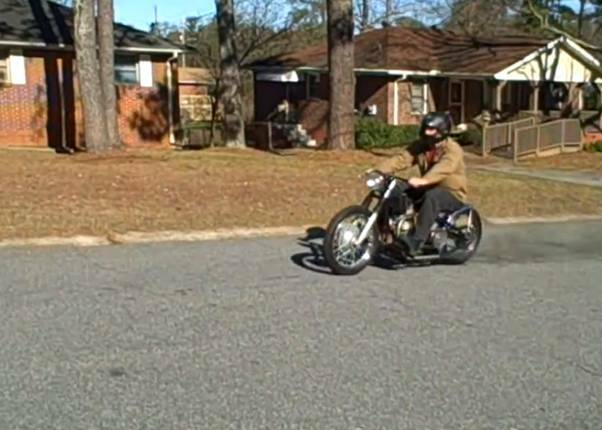 After rolling around quite a few Ideas I decided a motorcycle would be the best balance between weight, efficiency, and cost. And I knew that diesel would be my fuel of choice. Essentially wanting scooter-like mileage without the scooter “look”, I kept my eye out for a rolling chassis and found a 67 triumph 650 rolling frame. With this old of a frame I knew that registering and insuring it would be easier. I decided on the Single cylinder Yanmar clone 10hp model for the power plant. I purchased the engine on ebay for local pick-up as the seller was near me. 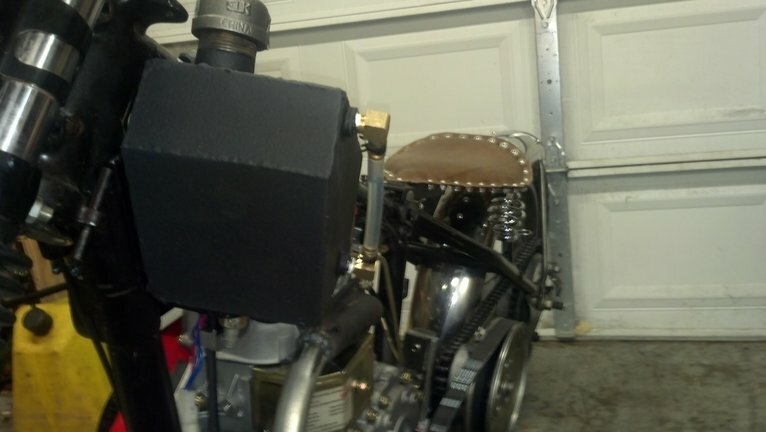 After bringing the engine home I mounted it to a piece of plywood, added oil, added diesel fuel and ran the engine as it came for 8 hours adjusting the engine speed several times to break it in. I then drained the oil and removed the filter screen and cleaned it. I took everything off the engine that was not needed such as the tank and the muffler. 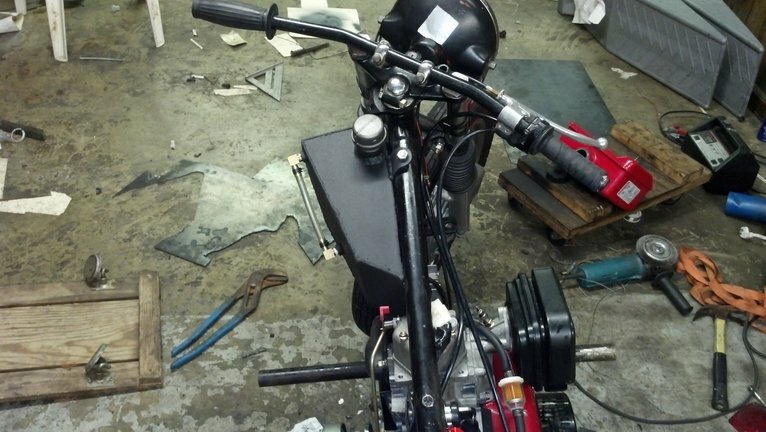 The engine was then placed in the frame of the bike to determine fitment. 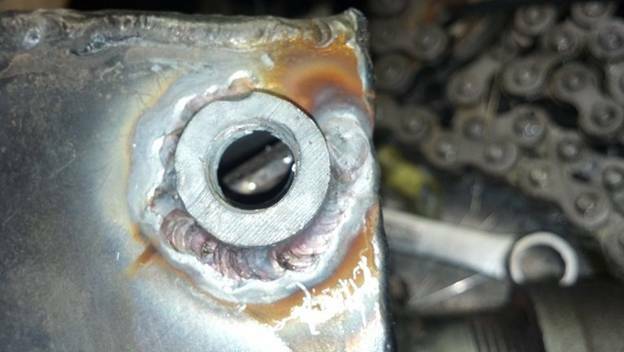 A piece of the upper frame gusset tube was removed and welded back in at an angle to allow clearance for the top of the engine. 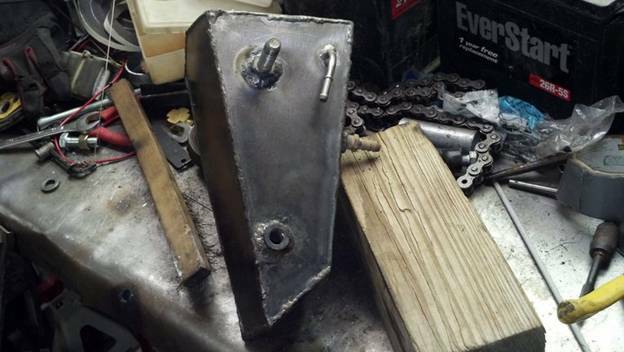 A switch plate was welded to the frame and uses the switch that came with the engine for the electric Start and Aux. power. The output from the Aux. power is run through the toggle switch and connects power for all the lighting. The reason for this is I wanted to be able to crank the engine before turning on the lights, the engine requires a lot of current from the battery to start and I did not want any systems running during start-up. For the front engine mount a 3/8” mild steel plate was drilled and tapped for 3/8x16tpi then welded between the frame tubes at approximately a 15 degree angle normal to the frame tubes. The rear mount consisted of 1x1x1/8” square tube with one end notched for the frame and the other cut to the same 15 degree angle as the front mount. These tubes were welded perpendicular to the lower frame tubes. 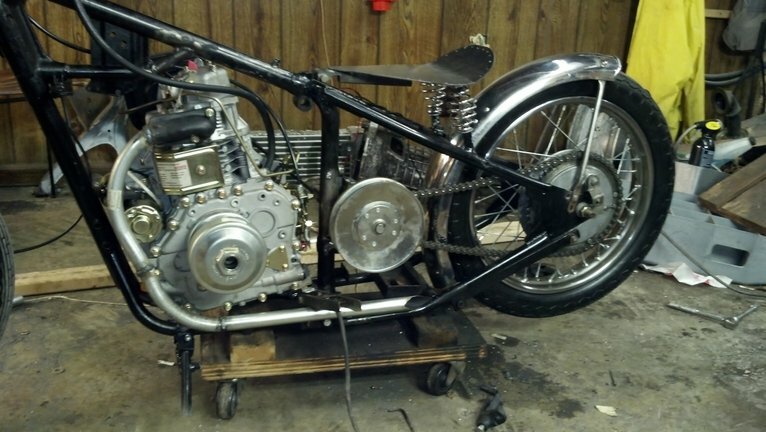 A ¼” mild steel plate with 3/8” holes was welded to the top of the square tubes to act as a mounting pad for the engine. Mounting hardware was grade 8, 3/8x16tpi with lock washers and flat washers. 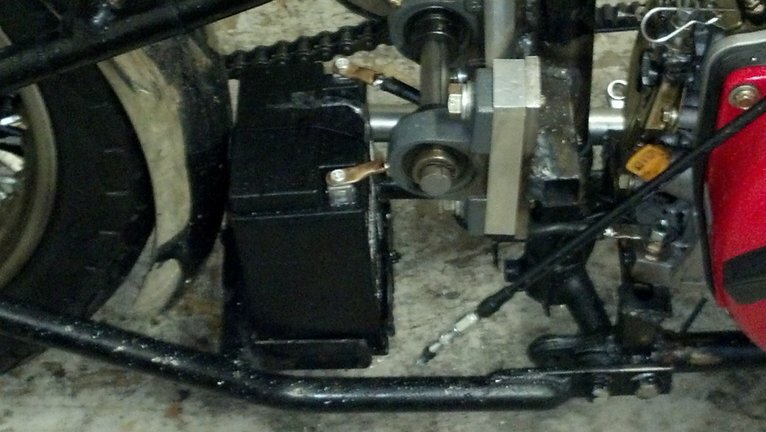 The jack shaft setup: a 1x1x1/8” piece of mild steel was notched and welded around the vertical frame tube. 3/8” mild steel plates tapped for 1/2x13tpi were welded to the tube. The original crankshaft-jack shaft spacing was 12” on center, comet does not make a belt in this size so a ~5/8” aluminum spacer was cut to increase the on center length to 12 5/8” which is a belt size offered. The jack shaft is ¾” with 3/16” keyway. The shaft was shortened and groves for c-clips were cut into the ends of the shaft. The pillow block bearings were sourced from an industrial supplier and mounted to the mounting points using Grade 8, 2x ½”13tpi bolts with lock washers and flat washers. Moly Grease was and is added to the bearings at intervals to ensure longevity. 11, 12, and 13 tooth 50 series sprockets with ¾” bore and 3/16” keyway were sourced from the same supplier along with a 50 series roller chain and master links. The 12 tooth is currently mounted to the shaft. 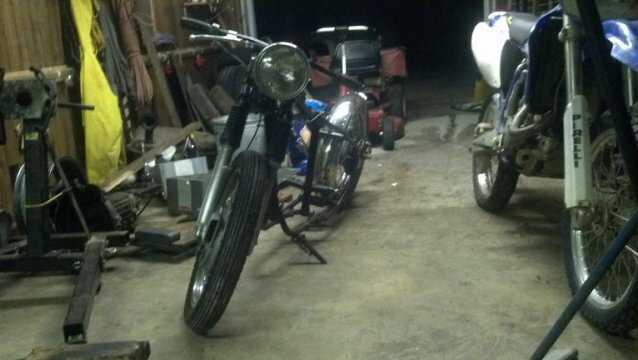 The original sprocket in the rear is a 50 series sprocket and worked out great. The exhaust was constructed using the original flange after cutting the muffler off some pieces of 1” EMT conduit were welded together after sanding off the galvanizing in the areas to be welded (inside and out). The tip was slash cut using an angle grinder with a cut-off wheel. Modifications to the throttle plate: The throttle assembly was removed and the large spring located on the pivot of the main throttle arm was removed. A spacer was cut down from a washer and used to keep the play in the main arm linkage to a minimum. The throttle cable mount was removed and the throttle cable I am using (1999 YZ-400F) was screwed into the original location. A hole was drilled towards the bottom of the throttle mounting plate and a tension only throttle return spring was mounted through the hole and extended to the attachment location of the throttle cable. A piece of steel sheet metal as welded to the top of the throttle stop location. 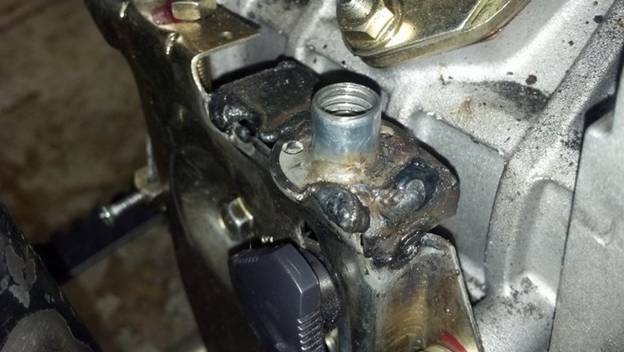 The piece had a hole drilled in it and a 3/8”x16tpi stand-off bung was welded in-line with where the throttle stop comes up. A 3/8x1.5”x16tpi bolt had a hole drilled through the middle and the head cut off. A nut was then drilled at the top and to the side to allow for a pin to be inserted. A steel rod was cut down and a notch cut in it. 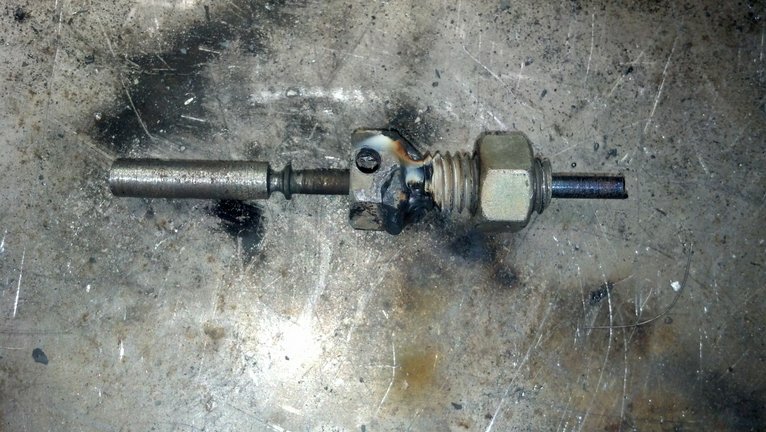 The bolt us used to move adjust the idle stop. 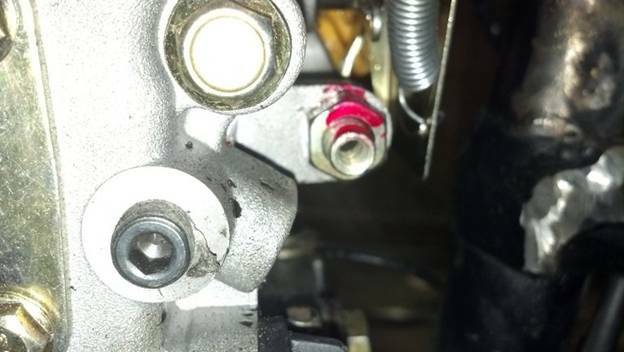 When the retainer pin is removed and the plastic knob lifted the engine will die. Pressing down on the pin and inserting the retainer pin sets the idle back to where it was. 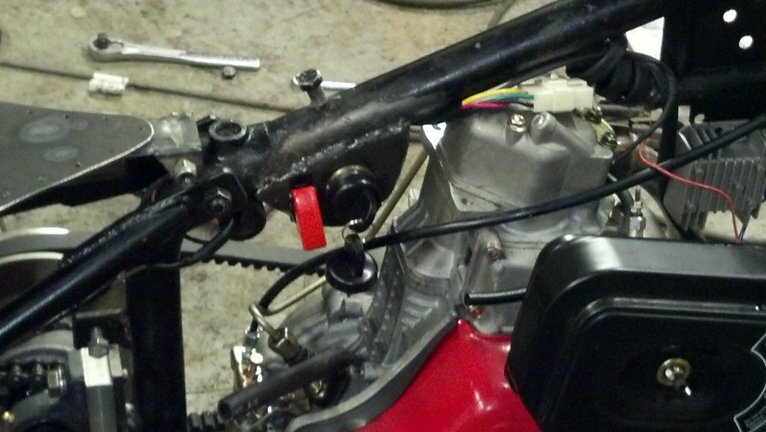 Red Loctite was used on both mounting bolts for the throttle mount plate and the plastic knob bolt inserted into the linkage to keep vibrations from loosening them. The tank, seat, and taillight bracket were constructed: Tank using 18 ga I believe, I looked up what the DOT requires for min. thickness and used that. The tank has a pipe fitting for the filler and cap, ¼ npt bungs for the fuel exit and sight fittings, and a 3/16 tube that runs from the bottom to the top of the tank for the fuel return from the injector. The tank was pressure tested, welded pinholes and coated in SEM rubberized undercoating. The seat pan is 1/8” mild steel hammered and rolled to shape, ¼” holes drilled around the edges. The hinge mount was constructed and welded to the bottom of the pan. Medium density neoprene foam 1.25” thick was glued using super 77 adhesive and shaped using a knife, sand paper, and a cheese grater for wood. A piece of leather was cut from an old couch and holes punched to line up with the holes drilled in the pan. The leather was moistened using water and stretched slightly over the foam. The stainless ¼”x20tpi button head allen screws and matching stainless nuts with nylon locking were used to secure the leather. The taillight bracket was cut and bent 1/8” mild steel with holes drilled to reduce weight. 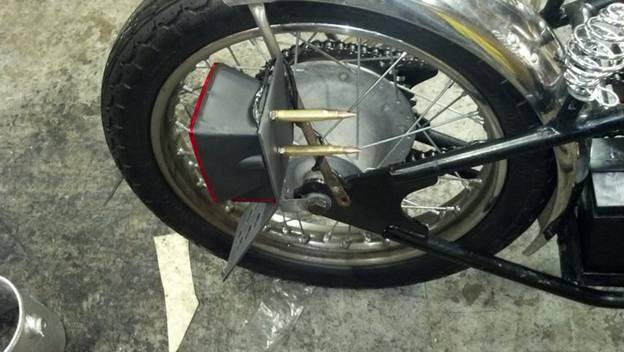 The rear light mounting bolts had the addition of some 30-06 rounds with threaded primer pockets. 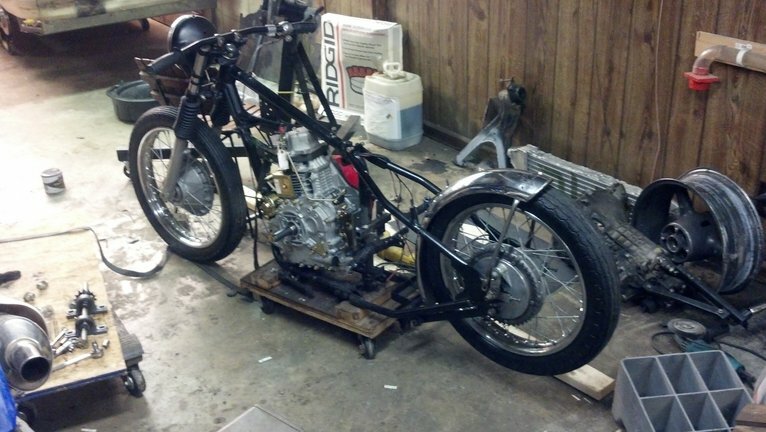 The complete start to finish cost was $1878.00, the rolling chassis was $680 so If you have your own you can deduct that from the cost putting the actual parts (conversion) cost around $1200 with hardware left over. Start to finish took about 20-30 hours. Top speed around 60mph downhill, steady cruising speed on level ground of 50-55 and uphill cruise speed of 45ish. My commute is 10 miles round trip with max speed limit of 45 which means traffic runs 50-55 and I do not have a problem keeping up with traffic. I have not weighed the bike but my weight is ~250lbs. Mileage tested in city driving and quite a few stop and go traffic lights to be 103 mpg. 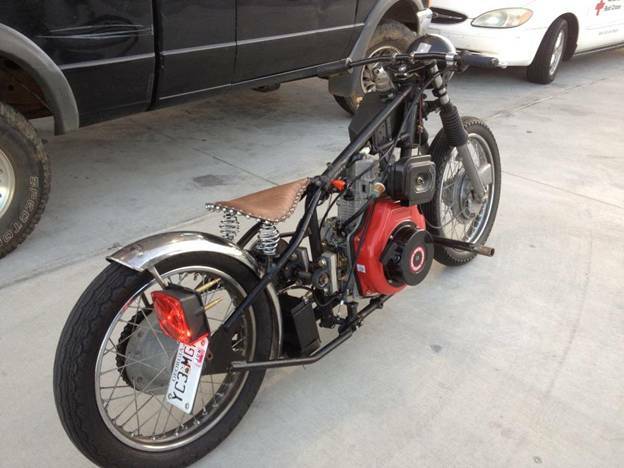 Many thanks to Justin for submitting his motorcycle build. Justin Juhan © Copyright. Hosted at DieselBike.net. All Rights Reserved.